Home » Kitchen Help Category » Flooring » Azrock Cortina Autumn Haze flooring in four kitchens — any more of you out there? Every fall, I have a really nice man named Ken come in to completely strip, then re-polish, the vinyl floor tile in my kitchen. It is well worth it. Even using heavy duty equipment, it takes him several hours to do the floor. I think it is well worth the expense. Not only am I am getting too old to be down on my hands and knees doing this, he gets a much better shine than I ever did. So far, I know of three other readers who have used my floor — Azrock Cortina Autumn Haze — and I have photos of their kitchens, too. Update: See this story about 15 new, similar patterns. This story includes an update on how to ask for Azrock Cortina Autumn Haze and get it. Kitchen undo almost finished. Cabinets stripped, wall paper off, new floor and counters. Still need to paint the trim. UGH! Before picture to follow. Beautiful kitchen, Julie! Send me all your pics and your story, girl! 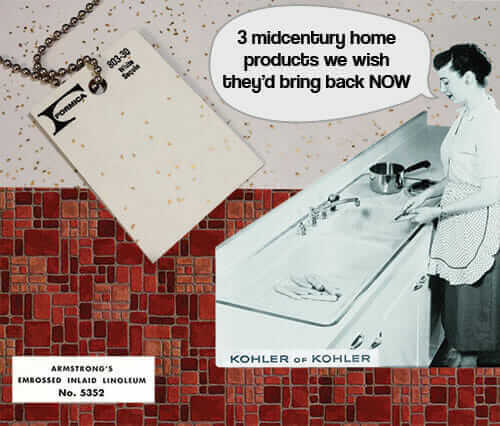 Janice used it in her retro kitchen renovation. 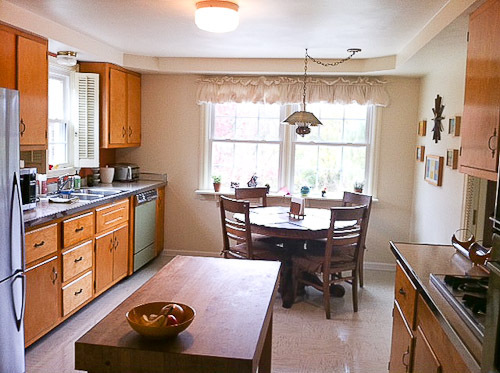 Meredith used it to replace the worn tile in her vintage kitchen. 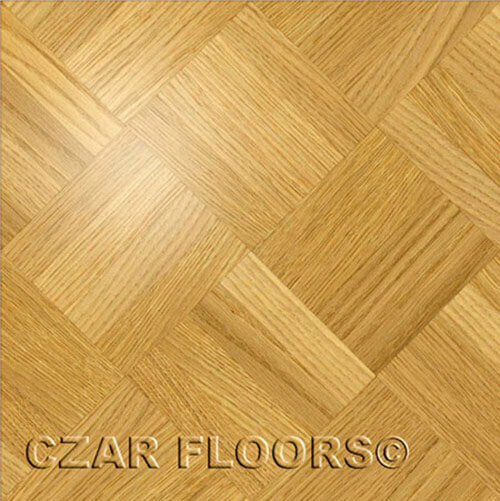 I have had my Azrock Cortina floor for since 2006, and it looks as great as it did the day it was put in. 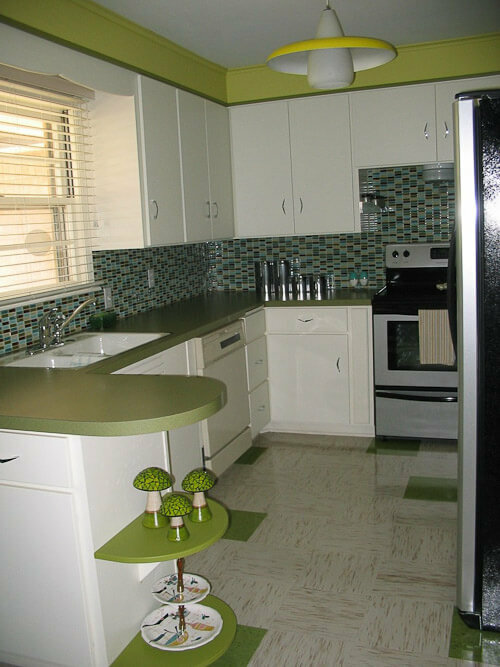 I continue to be the #1 fan of this versatile, inexpensive, streaky retro-style, durable vinyl kitchen floor tile. 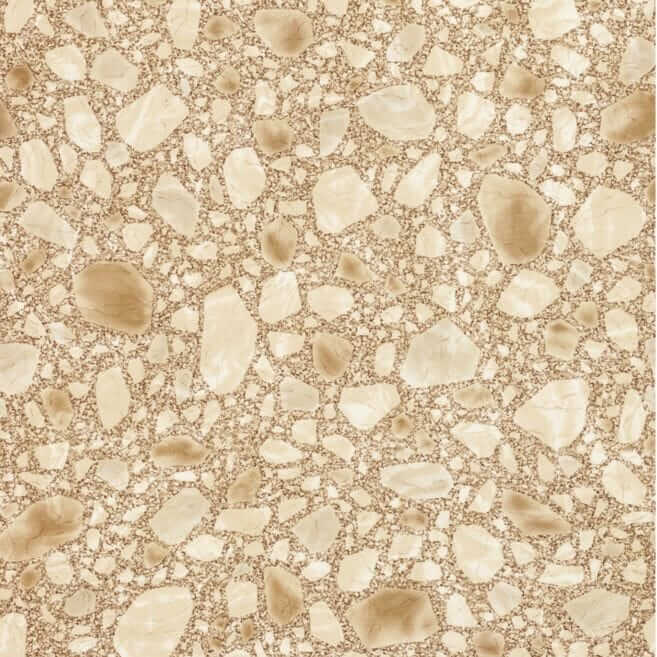 This tile is $1.50 – $2.25/s.f. installed. See Autumn Haze and their other colors here. 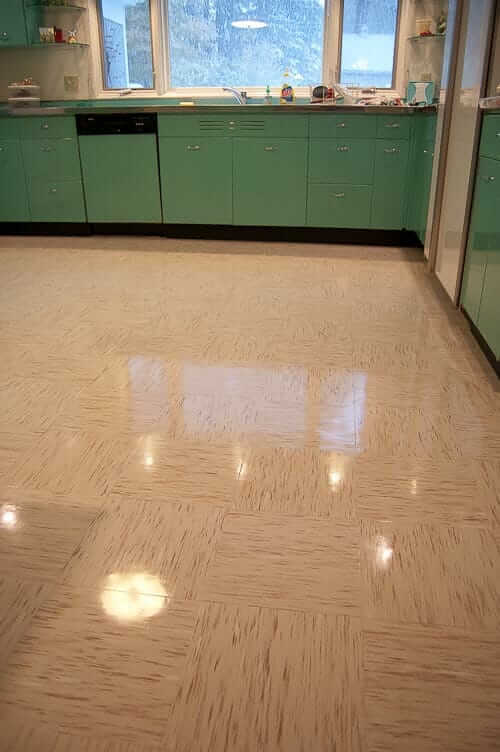 Want to read more stories about flooring options: See our navigation Kitchens / Flooring here. 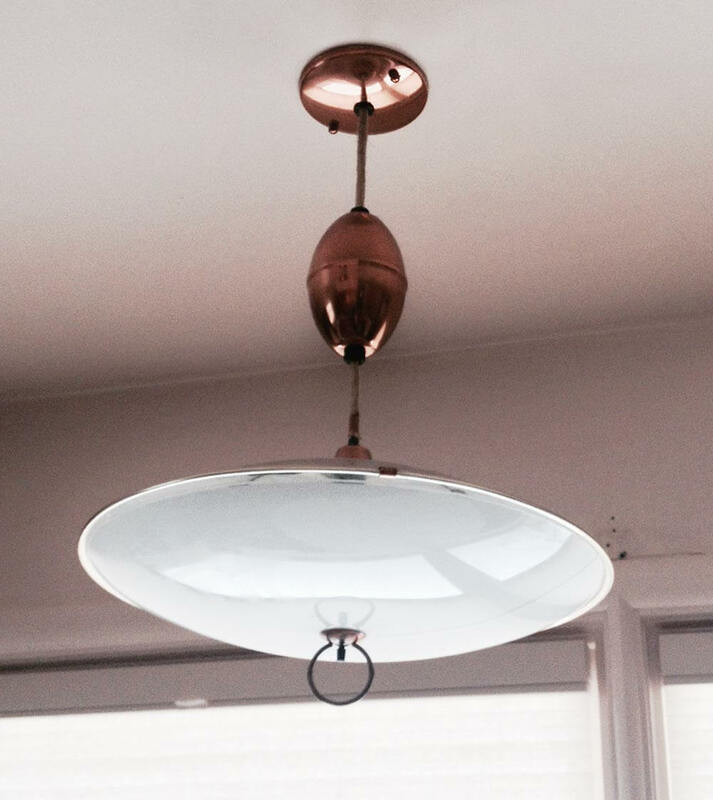 Have any other readers put Azrock Cortina in their kitchens? I just closed this past Monday on a 1938 white stucco, right next door to where I have currently lived in a 1932 cottage for 5 years. Azrock will be perfect for the kitchen. I am excited to have already identified that important rennovation factor! I will be photographing the entire house, “as is” before starting, then “as completed” and then fully decorated. I haven’t selected colors yet, but will probably use black and white or black and light grey combination. I want to do my kitchen in white with black and red details. The 1938 stucco has been locked up, with no one living in it, fully furnished and with utilities kept on, for the past almost 20 years – an estate tie-up. I learned the story of the house next door within days of moving into my current home, and have been trying to facilitate a purchase ever since. In the meantime, waiting for the family to come to a decision to sell, I have been busy building a senior home care business, for which I began a two year preparation, leading up to a divorce of an almost 40 year-long marriage five years ago. With busy business schedule and hopes to by the home next-door, I have just existed beneath the roof of my current home, never doing any rennovation or decoration, for that matter, counting heavily on being allowed to purchase the house next door, sitting on a lot 5 times the size of other lots on this street, which was another huge enticement to me. I have big plans for the large back yard, which I won’t go into, now. I have just engaged Jason Newsom, of Newsom Roofing, Spring Hill, TN to help me doubly spearhead the total rennovation of the house, using as many original 30’3/40’s pieces as possible. Jason is a young man in this 30’s with an enthusiasm and knowledge of different period styles, and he is excited to be participating in this particular project, because of the intended authenticity planned. The kitchen will be decorated specifically around a white and red enamel metal table with original red chairs, from my earliest chidhood. Mother and Daddy married in 1946, and it was the first kitchen set they purchased. My other two sisters don’t have memories of it being used in our kitchen, but I do, and it is my favorite piece from childhood. By the way, colorwise, it coordinates very well with Dddy’s shiny, bright red, 1947 McCormick Cub tractor, which I also have, complete with all attachments, including little trailer, which will be the focal point of Christmas lawn decorations this year!!!! I plan to enter my home in the local historic Christmas home show the first weekend of December. 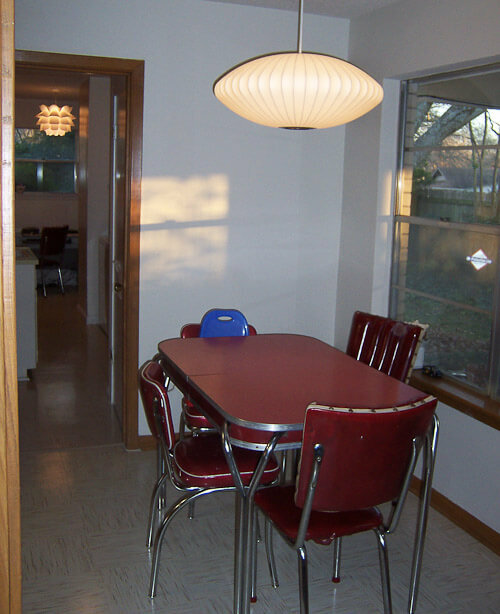 Most homes on the tour are 1800’s, but I am going to be campaigning between now and then to organize a group of homeowners of our many 1930’s and 40’s homes, most of which are darling cottages, including some Sears home kits and one very special, accurately restored, Lustron home. I believe that it is the only one in Tennessee. I look forward to sending you photos of my kitchen project, which will include your Azrock tile. I am hoping to have the local newspaper follow the project, also, and will also start a website and blog to cover it. Cool! Welcome! Please know we have another story that came later about even more streaky Azrock tiles introduced – TexTile line. See Kitchens/Floorings … and all the categories up top, for resources. And yes, be sure to take lots of before and after photos! If anyone near Clarksville TN or Guthrie KY is interested in Lustron homes, there is one in Guthrie, on the same road that runs from Tiny Town to Clarksville. It is on the south side of the road and is brown inside Guthrie city limits. I was shocked to see it and 15 years ago it looked very original. On the other side of Adams highway, near the railroad tracks, is an international style art deco home with a flat roof. It’s very nice. My grandmother lives in Adams (Bell Witch fame) and it is a quiet, close knit community of very nice people. Guthrie is the nearest little “town”. There is a lot of interesting architecture in Guthrie. I am using this type of tile all over my new home! I love all the great colors you can get in commercial tile. It will be throughout my kitchen/dining and living room as well as both of my bathrooms. Can’t wait!!! Can post pics when I’m done.